Raaga.com: New twist in the controversial Tamil ‘Beep Song’! 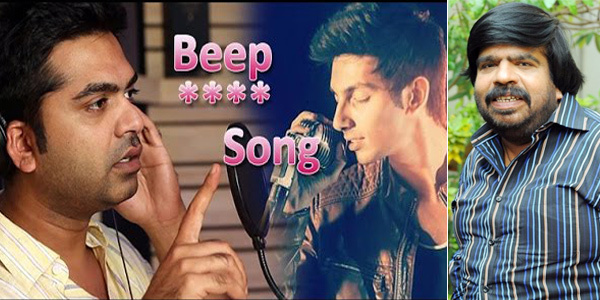 New twist in the controversial Tamil ‘Beep Song’! The controversial Tamil song ‘Enna P*******Ku love panrom…’ popularly termed as the ‘beep song’ is the latest addition in the series of offensive lyrics that are going from worse to worst. The song that disgraces womanhood as it demeans women’s private parts has attracted stern criticism from both film fraternity and wrath of social women cell. The All India Democractic Women's Association (AIDWA) have even lodged a complaint with the Coimbatore police seeking strict action against singer Tamil film actor Silambarasan (Simbu) and composer Anirudh Ravichander, who became a national craze with his Dhanush song 'Kolaveri Di', for disrespecting women. Based on the complaint the police have registered a case under Indecent Representation of Women Act, 509 IPC and 67 of Information Technology Act against the duo Simbu and Anirudh. However in a swift change of action both Simbu and Anirudh have declined their association with the song! Showing his reverence towards ladies he wrote, “I wish to reiterate I have the greatest regard and respect for women putting to rest all speculations on this subject." Like Anirudh, Simbu too has taken a U-Turn stating that someone had stolen his song and released it online and thereby has invaded his privacy.